The Inheritance tax laws vary from country to country, and spending significant time overseas can complicate this by exposing you to multiple jurisdictions. This is further compounded by the fact that inheritance tax laws, relative to other tax systems, tend to change more frequently, requiring you to constantly stay on top of things. To understand one reason as to why this is, one must look at how the taxes and budgets are implemented. For instance, most governments arrange their annual budget into categories resembling “mandatory spending” and “discretionary spending“. An example of mandatory spending would be public spending on healthcare or police, whereas discretionary spending would be government development and one-off infrastructure plans, or a particular representative’s pet projects. Because mandatory spending items are much larger, and involve largely fixed and predictable (and, arguably “less up for debate”) spending, the taxes which provide the revenues for the mandatory spending are much harder to change. Whereas, the taxes linked to providing the revenue for discretionary spending are more susceptible to change as the annual discretionary spending budget moves up or down. Inheritance tax is often linked to discretionary spending, ergo it is one of the taxes that can predictably change many times throughout one’s career, sometimes every year. Just this year, the Japanese government moved to alter the way inheritance transfers are taxed, both to Japanese citizens and foreign nationals whether they currently live in Japan or have lived here in the past. In Japan, inheritance tax is levied not on the deceased themselves or their estate, but on each individual that has received the inheritance or gift in the taxable year (beneficiaries). 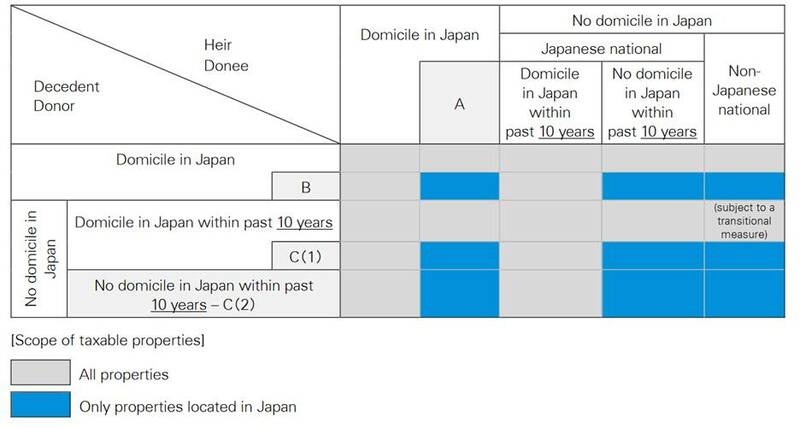 Whether the inheritance tax is in fact applicable is determined by whether or not the person currently, or has in the past maintained a domicile in Japan, whether or not the inherited or gifted assets are located in Japan, and if the recipient is a Japanese citizen. The changes implemented in this year’s tax reform were problematic for the foreigner and expat community located in Japan, as well as those considering to work temporarily in Japan at some point in the near future. Among the changes, the primary alteration has to do with inherited property that happens to be located outside of Japan, and for assets inherited by a foreigner that has only temporarily lived in Japan. Also included in the changes, are conditions that aim to prevent Japanese nationals hoping to get around the inheritance tax laws by temporarily moving out of the country. Tlthough this could be appreciated for its simplicity, it left much to be concerned about for foreigners living in Japan who had no intention of making the country their new and permanent home. As the code was written, someone working temporarily in Japan, whether they happen to pass away with significant assets or come into inheritance while living in Japan, the Japanese government would technically be claiming not only Japan located assets, but also non-Japan assets. For example, a foreigner comes to Japan on a temporary work assignment, and while living here his grandmother passes away, leaving him a million dollar home. Now, grandma and the parents had already sorted out their affairs in his home country to ensure there was no, or minimal tax payable. However, under the previous Japanese system, he could be liable for hundreds of thousands of dollars worth of inheritance tax in Japan. This temporary work assignment just got much more expensive than anticipated. For this reason, it was postulated that a significant number of highly skilled foreign professionals and executives were being discouraged from considering positions in Japan, thereby hindering the Japanese economy. Although slightly more complicated than the previous system, it is worth taking a moment to read through and understand the various scenarios to see if you currently, or in the future, could be subject to inheritance tax. There are a few changes, with the most prominent being the impact of inheritance tax on foreigners who have only been in Japan for a short period of time. For example, if you have been living in Japan for 10 years or less, only assets located in Japan will be subject to inheritance tax. In the above example, the temporary worker would not be taxed on receiving grandma’s home overseas. If, however, he decides to renew his visa a few times, and has been in the country for more than 10 years, regardless of receiving his eijuken (permanent residence status) or not, the overseas property would become liable for Japanese inheritance tax if grandma passed away after his 10 year mark. It becomes even more complicated from another angle after someone crosses the 10 year threshold in Japan. At that point, even if you leave Japan and become resident in another country, overseas inherited assets could still be subject to Japanese tax. 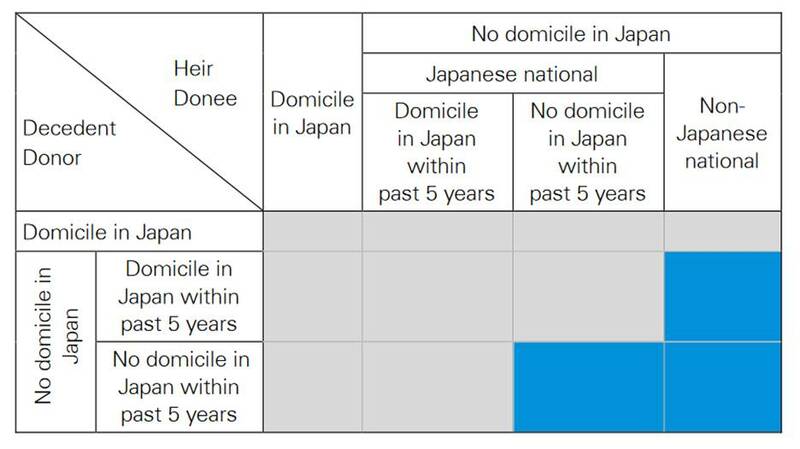 Using the above example, if after living in Japan for 10 years he moves overseas, if at anytime in the next 5 years he receives an inheritance, it would be subject to Japanese tax. 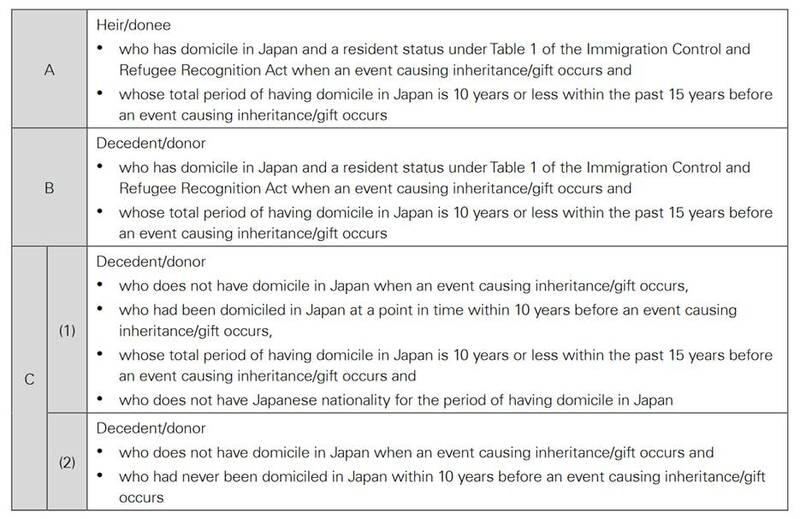 Upon receiving an inheritance, for foreigners not living in Japan at the time of receipt, the code states if you have lived in Japan for at least 10 years out of the previous 15, the assets would be subject to Japanese tax. If, however, in the previous 15 years you had lived in Japan for 10 years or less, only properties located in Japan would be taxable. Although on the surface it can seem complicated, the new system is regarded as a much more fair and reasonable approach to taxation of inherited foreign assets. This does not however mean that foreigners living in Japan can stop worrying about any overseas inheritance that may be coming their way in the future. After crossing the 10 year mark, the Japanese inheritance tax system returns to its strict roots; and one would be advised to keep up to date of any future changes or reforms to the tax code that are sure to crop up from year to year. – Gomi, Yūji. Guide to Japanese taxes. Zaikei Shōhō Sha, 2005. – Bauer, John, and Andrew Mason. “The distribution of income and wealth in Japan.” Review of Income and wealth 38.4 (1992): 403-428.